A review of Collecting Balinese Art: The Forge Collection of Balinese Paintings at the Australian Museum in Sydney, by Siobhan Campbell. Siobhan Campbell’s dissertation revolves around a collection of Balinese paintings assembled in the 1970s by the British anthropologist Anthony Forge (1929-1991). These paintings, currently in the Australian Museum in Sydney, were acquired during Forge’s year of fieldwork in the village of Kamasan on the island of Bali. While the collection is the impetus for the dissertation, Campbell’s research is less about individual works (although she does closely examine some) and more about the complex relationships between art, artists and collectors in Kamasan. Like other recent social scientists working with material culture, Campbell avoids unidirectional expressions like impact or influence and structures her arguments instead around the notion of entanglement. Under this framework she examines Forge’s project of collecting Kamasan paintings within the broader history of artistic production in the village, and through the eyes of both Forge (through his diaries) and the villagers of Kamasan (through Campbell’s interviews). She then looks closely at the role of painting as a commodity in Kamasan and the many paths paintings travel between workshop, home, temple, marketplace and museum. Finally, Campbell examines the collection’s place within a museum and encourages ongoing engagement between museums and creator communities. Campbell is well aware of the parallels between her research and that of Forge. The complexities of intercultural communication were perhaps more intricate for Forge, who spoke neither Indonesian nor Balinese, and whose interactions with the artists of Kamasan were mediated through a high caste translator. Campbell’s own experience was colored by following in Forge’s path. This is made particularly explicit when one of the artists Campbell interviews hopes that she will find fame through her interactions with Campbell, in the same manner her father (another artist) found fame through his connection with Forge. As a female researcher in the early twenty-first century, Campbell is also much more mindful than her predecessor of the role of women in the production of art in Kamasan. The information she learns through her access to and engagement with the women artists of the village, fills a gap in the scholarship on the subject. Klungkung, the administrative district in which the village of Kamasan is located, is the smallest of Bali’s eight administrative districts, yet has played a significant role in the history of the island. In her introduction, Campbell briefly reviews the history of this region, emphasizing the powerful courts of Klungkung and their association with the artists of Kamasan. The painted ceilings of one of the palace buildings (the Bale Kambang at the Kerta Gosa complex) are proof of this relationship and date at least to the mid-nineteenth century (although they have been repainted several times). Although the members of the royal family of Klungkung have no formal political authority today, they are respected, and patronage ties to the court continue to be important to the status of artists. After summarizing the forms and functions of Kamasan painting, Campbell traces the changes in scholarly interpretations of this style of painting. 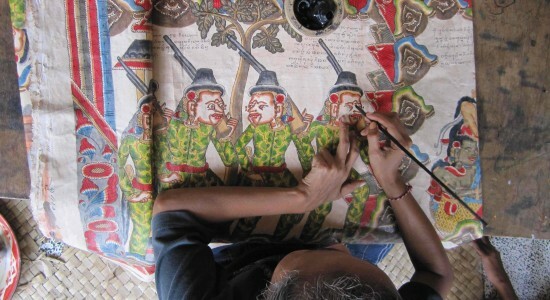 While early generations tended to focus on how the narratives depicted might relate to known textual sources, in more recent times, greater emphasis has been paid to investigating Balinese approaches to visual material. In the final part of her introduction, Campbell discusses other studies of material culture and museum collections and outlines her own theoretical approach, which focuses on notions of circulation of art as a commodity and entanglement within the relationships between producers and collectors of art. In Chapter 1, Campbell examines the history of the collecting of Kamasan paintings. She briefly surveys stories of Balinese collecting, looking first at royal patronage and then at the local acquisition of paintings for private and public collections. Campbell notes that the explicit aim of some of the Balinese museums is to keep the artistic heritage of Bali on the island. According to her research, many of the artists of Kamasan are not uneasy with the idea of their paintings being collected by foreigners and take it as a point of pride that their work is known internationally. The bulk of the chapter looks at foreign patronage, which she divides into four categories: colonial officers, scholars and ethnologists, artists, and tourists. After discussing some of the most important collectors of Kamasan painting from colonial times onward, Campbell singles out Anthony Forge as being exceptional because of his systematic approach to collecting and his close inquiry into local interpretations of paintings. Chapter 2 focuses on Forge, chronologically tracing his involvement with emerging field of visual anthropology. This interest most likely was kindled during his undergraduate studies at Cambridge where he had access to the Bateson collection of Sepik Art. He began with his own work with the Abelam of the Sepik region of New Guinea in the late 1950s, returning for a second period of fieldwork in the early 1960s. During his periods of fieldwork in New Guinea, Forge acquired material both for himself and for museum collections. Unlike other scholars who also collected, Forge wrote clearly about the exchange value and status of objects as well as his own role in these networks of trade. Forge was particularly interested in art as a symbolic system that was not tied to systems of language. He argued that art of the Abelam communicated things that could not be verbalized, but this left open the challenge of how someone from outside the community could understand it. The last part of Chapter 2 traces Forge’s involvement with Balinese art, from his move to Bali in the 1970s until his death in 1991. In particular, Campbell focuses on how the painting collection was put together and circumstances surrounding its eventual acquisition by the Australian Museum in Sydney. Buying directly from artists, from traders and from art shops, Forge collected both old and new paintings, in a variety of styles and qualities. In studying how painting communicates in Kamasan, Forge faced a very different situation than in New Guinea, for while in both places art played a role in ritual contexts, in Kamasan the understanding of painting is closely tied into the knowledge of local narratives and Hindu Balinese mythology. In this chapter Campbell also assesses Forge’s contribution to the field, noting that he is not known for his study of Bali but primarily for his work in New Guinea, about which he published far more material. Yet, she argues, Forge’s contributions should also include his teaching, speaking and collecting projects. In Chapter 3, Campbell turns from Forge’s own story to the recollections of the villagers of Kamasan. Because there has been little migration from the village in the years since Forge conducted his research, Campbell was able to visit the families of many of the same artists that Forge had interviewed. By sharing photographs of people and paintings taken by Forge, Campbell elicited reflections both on the time of Forge’s collecting project and the changes that had occurred in the intervening 40 years. The economic value of paintings was of recurring interest, and reflects contemporary concerns as well as an understanding of the economically fraught time that Forge was conducting his research (after the violent purges of 1965-66). In this chapter Campbell pays particular attention to the stories of two of Forge’s contacts in Kamasan: his translator, Ida Bagus Purnama, and the artist with whom he had the closest collaboration, Mangka Mura (1920-1999). In Chapter 4, Campbell turns her attention from the subject of collecting to an examination of how the painters of Kamasan talk about their own work. Most Kamasan painting has a narrative subject. It is often described as “classical” or “traditional” painting, but Campbell shows that while it is often stylistically conventional, it is open to innovative narrative interpretations. Forge, who knew little about the corpus of narratives that inspired Balinese painters, learned these stories from his interviews with artists. He concluded that paintings of mythological subjects could communicate on many levels and could contain subtle criticisms of communal hierarchies. Campbell writes that Forge’s focus on listening to local voices (rather than depending on written texts) was groundbreaking and presaged the work of later scholars who became attuned to the many ways that knowledge was disseminated, especially through oral traditions and performance. The correlation of Kamasan painter with dalang (puppeteer) seems particularly apt, as both need the deep knowledge of a wide range of narratives, but are also able to connect narratives to contemporary places and events as well as the lives of their audiences. Using the artist Mangku Maru and his daughter, Mangku Muriati, as the central focus of the chapter, Campbell records how the artists within this one family explain their work, focusing particularly on how innovation has played a role in their artistic practice. Explication is particularly important to Mangku Muriati, who was explicit in stating that commentary was what brought paintings to life. Examples of innovation include painting new subjects in response to commissions and drawing inspiration from new forms of storytelling (radio broadcasts). Perhaps most interestingly, Campbell illustrates how Mangku Muriati, much like a dalang, incorporates present day concerns with status, politics, and ritual obligations into the mythological or historical narratives she paints. Campbell broadens her focus in Chapter 5 to describe, in general terms, the production and exchange of painting in Kamasan. She begins with a quick summary of the economic and cultural role of painting in the village. Within this chapter Campbell moves beyond the stereotypical description of Kamasan painting as being produced either for a temple setting or for commercial exchange. Her consideration of the “fluid boundaries between ritual and commercial prerogatives” is nuanced and a significant addition to the study of Kamasan painting. In order to demonstrate the complexity of the role of art in social relationships within the village, Campbell uses the example of I Nyoman Mandra, the most well-known practicing Kamasan artist today. Like most Hindu Balinese, Mandra has fulfilled his obligations to temples through personal labor, including the production of paintings. He has also helped temples raise funds through selling paintings that have been removed from temples for replacement. His success within Kamasan is seen in part as a result of his fulfillment of his ritual obligations and his commitment to the community through his teaching and his leadership of the largest painting collective in the village. A vital part of this collective is the women artists who both color and sell paintings at his studio. One of the major contributions of Campbell’s dissertation is its consideration of the role of women in the production of painting in Kamasan. Forge’s mention of the role of women artists in Kamasan is minimal, but his photographs prove that they were active participants in the 1970s (and other photographs from decades earlier portray women painters). Campbell gives voices to these women in Chapter 6, through her observations of, and interviews with, a broad group of artists. Part of this chapter describes the collaboration involved in the production of Kamasan painting, focusing on the position of predominantly female colorists, whose work has traditionally been considered less important than that of the mostly male artists who initially sketch the compositions. In her discussion of these artists, Campbell provides an alternate account of art-making in Kamasan. She considers the work of women who contribute to the production and sale of art, but do not consider themselves artists, as well as women who work independently, both sketching and coloring their own paintings. For both groups the role of art as a commodity is a frequent subject of conversation. Campbell suggests that this preoccupation might be a way of asserting their important role both in the preservation of the tradition of painting and in the welfare of the village as a whole. Campbell’s concluding chapter is the most theoretical section of the work, and looks back at the three major components of her research through the framework of entanglement. First she considers intercultural relations and communication, then commodification and circulation of art, and finally collection and display of art. Within her conclusion Campbell stresses the agency of the Kamasan community in the making of the Forge collection, as well as Forge’s sway on the market for painting and (after the catalog made its way to Bali) the production of painting. Campbell presents a new definition of traditional painting not as an unchanging art form, but as one that is often linked through ancestral connections to the courtly history of the region. Although stylistic continuity within the art form is important, the meanings and interpretations of paintings have changed over time. Campbell ends the chapter with a model for museum engagement that foregrounds the necessity of indigenous perspectives for the study of museum collections. It also stresses that these perspectives are dynamic, thus relationships between artists and collectors should not stop when artworks enter a museum collection; ongoing collaborations are mutually beneficial. Fieldwork conducted in Kamasan, Bali. University of Sydney. 2013. 301pp. Primary Advisors: Adrian Vickers and Peter Worsley. Image: Mangku Muriati, Kamasan, Bali, 2011 (Photograph by Siobhan Campbell).